nerves including pain in the area of compression, radiating pain, such as sciatica or radicular pain, numbness or tingling, burning sensations or weakness related to certain activities. These two full days of practice workshops are exclusive to Massage & Myotherapy Australia and will attract high interest so book now! 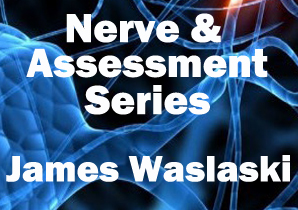 James Waslaski is an author and international lecturer teaching approximately forty seminars per year around the globe. He has developed orthopaedic massage and sports injury DVDs and authored manuals on Advanced Orthopedic Massage and Client Self Care. James presents at state, national, and international massage, chiropractic, and osteopathic conventions including keynote addresses at the FSMTA, World of Wellness, and Australian National Massage Conventions. As an industry pioneer, James was inducted into the Massage Therapy Hall of Fame in 2008. Please advise of any dietary requirements or allergies at the time of registration and review the Dietary and Food Allergen Statement.